This month Deb from Taste and Tell and Elle from Feeding My Enthusiasms chose a fun challenge for all of us to try - Cheesecake Pops. What are these little confections, you ask? They're frozen cheesecake balls that are dipped in your choice of chocolate and dressed up any which way you like. I dipped my pops in three types of chocolate and used a variety of sprinkles. The cheesecake baked up great. I had no problems with it. The cheesecake tasted very yummy and was not heavy at all. Even though scooping and rolling was a little messy, the balls froze well. Dipping was a breeze too. I found it was easier to spoon the chocolate over the balls than dip them directly into the melted chocolate. If you ever want to make something novel for a party or occasion, these would not be a bad choice. They're fun and imaginative and you can customize them any way you like. I know some Daring Bakers even flavoured their chocolate. I enjoyed this challenge immensely and the cheesecake is definitely a keeper, even if you only make one-third of the recipe. To see the recipe, please visit Elle or Deb and to see all the other Daring Baker creations, please go to the blogroll. I first saw the brownie-mint patty combination in a Maida Heatter cookbook. She put a layer of mint patties between the brownie mixture and, since I enjoy the mint-chocolate combination, it sounded quite delicious. Fast-forward a few years and and I have finally gotten around to making a similar version using plain old Coolmints. I would have bought the suggested York Peppermint Pattie Bites had I read the recipe through completely. No worries though - I just chopped them up, followed the directions and was rewarded with a chewy, minty brownie. Enjoy with some cold milk, or turn them into brownie sundaes as Dorie suggests. Either way, this is one super-cool treat! Give yourself some time to make these as you need to let the dough chill for at least 2 hours. The recipe is straightforward with no baking gymnastics required. Once chilled, the cookies are rolled in more wheat germ and baked. What you end up with are perfectly uniform cookies a little bigger than the size of a Toonie. They are nutty, chewy and tangy (from lemon zest) all at the same time. I used PC Organics Pure Honey and I think the flavour would change depending on what type of honey you use. 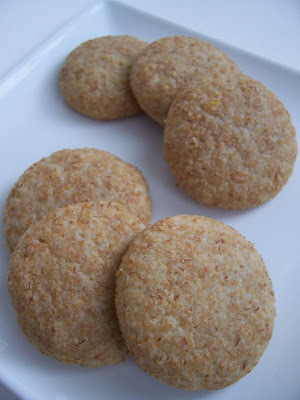 These cookies went over well in my house (with adults anyways) and are a perfect match for tea. Definitely a healthy treat keeper. Do you like Maltesers - those crunchy chocolate-covered balls of yumminess? If you do, then these cookies are made for you. 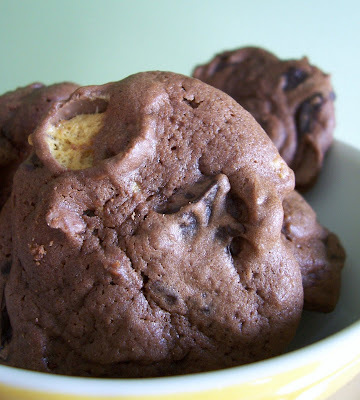 These Whopper (or Malteser) Drops are hearty, chocolatey cookies filled with bittersweet chocolate, malt balls, malt powder and cocoa. They are intense and slightly cakey but wholly satisfying. If you're wondering about malt powder, you can substitute Ovaltine, a powdered drink mix. When I was younger I tried hot Ovaltine and thought it was pretty much the anti-hot chocolate but, as I've grown, I have come to see the benefit of this malty beverage. I still don't drink it but, its esteem has risen in my eyes since I can bake with it. Also, try to find bittersweet chocolate. It gives the cookies a certain 'poshness' that semi sweet chocolate would not be able to. The bitterness goes well with the malt and sweetness of the balls. When I make these again I would leave the Maltesers whole since they sort of disappeared in the cookie dough. Try them out - they're not pretty but they're good!